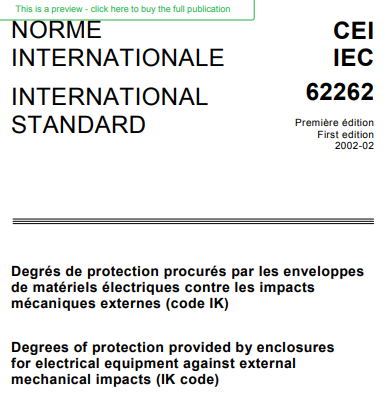 The IK Code (otherwise known as Impact Protection Rating) consists of the letters IK, followed by two digits. These two digits help us to identify the level of protection a piece of equipment offers. As defined in the international standard IEC 62262 and IEC 60068-2-75, it classifies the degrees of protection provided by enclosures for electrical equipment against external mechanical impacts. This standard specifies the way enclosures should be mounted when tests are carried out, the atmospheric conditions that should prevail, the number of impacts and their (even) distribution, and the size, style, material, and dimensions, etc. of the various times of hammer designed to produce the energy levels required. 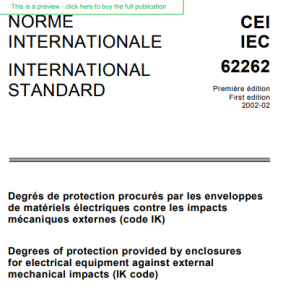 The table below defines the IK codes and the impact protection tests that they withstand, based on the tests carried out according to IEC 62262. There are some circumcastances where the product requires even greater protection such as those used in custodial or public spaces, and so the following codes can also be used. It does need to be noted, that whilst EN60068-2 does not allocate codes above IK10, the following have been extrapolated and designed in accordance with this testing. IK11 Protected against 35 joules impact. Equivalent to impact of 10kg mass dropped from 350mm above impacted surface. IK12 Protected against 15 joules impact. Equivalent to impact of 10kg mass dropped from 500mm above impacted surface. IK13 Protected against 75 joules impact. Equivalent to impact of 10kg mass dropped from 750mm above impacted surface. IK14 Protected against 100 joules impact. Equivalent to impact of 10kg mass dropped from 1000mm above impacted surface. IK15 Protected against 125 joules impact. Equivalent to impact of 10kg mass dropped from 1250mm above impacted surface. IK16 Protected against 150 joules impact. Equivalent to impact of1 0kg mass dropped from 1550mm above impacted surface. We are the UK’s leading supplier of full scope LED lighting solutions, including intelligent lighting, world-leading luminaires and specialist emergency and ATEX applications. As UK authorised distributors of CREE, Di-Astrum, Teknoware and more, this page details technical specifications for some of our most popular lights. We are also able to build bespoke solutions sourcing unique and custom-made fittings from hand-selected manufacturers. Spec sheets and other information documents are correct at time of sourcing from supplier but are used at customer’s risk. Accuracy and relevance should be confirmed with IcLighting or the supplier before purchase or installation. One of our team will be in touch within 48 hours. If you need urgent assistance please call us on 01780 435002.